A review of Punk Avant-Gardes: Disengagement and the End of East Germany, by Seth Howes. Seth Howes’s exploration of the material and theoretical realities of East German punk emphasizes the visual and sociological similarities of punk as a truly global development, while also pointing to the contextual particularities that made punk operate differently in the East German space. Arguing by example, Howes illustrates the uniqueness of GDR punk through in-depth case-driven analysis. Lyric, biographical, and visual examples are treated not simply as aesthetic objects, but as the material outcomes of a cultural logic that underpinned this non-conformist cultural practice. In this account, punk is treated as a potent example of a “detached” or apolitical attitude that cohered with the GDR’s rebellious underbelly, particularly in its final decade. Reacting against the country’s overly coordinated and disciplined reality, Howes argues, punk became a formal (that is to say, legible and transferable) mode of differentiation from society, which punks used to make “public their own self-recusal from programmatic politics” (p. 29). Traversing nearly the complete span of the four-decade history of East Germany, Punk Avant-Gardes draws from sources that describe its national (i.e., ideological and idealistic) foundations as well as the ways that these foundations bent—or refused to bend—as the country’s ethos evolved from the Stalinist orthodoxy of the immediate postwar to the consumer socialism of its final decades. Howes reads these official sources against punk’s “representational brickbats” (p. 29) to illustrate the ways in which the state and its subjects at once stood in contestation and yet inevitably, and by definition, commingled. In this regard, though Howes embraces the apolitical ethos of punk, he argues that in the East German context, where the state staked its identity on the political commitment of its citizens, punk’s civic refusal was itself indeed a political act. Chapter One, “The New Punk Man,” establishes punk’s adversarial relationship as ontological. That is to say, the identity of the punk is essentially pit against the identity of the state’s ideal East German subject, i.e., the New Socialist Man. Howes fuses historical definitions of this well-groomed, politically committed, antifascist, and community-oriented figure to the ways in which East German cultural policy deployed the “social-material power of [New Man’s] representation” (p. 46). He argues that cultural and security authorities (Stasi) reacted hostilely to punk in large part because the punk attitude of disengagement from the state so visibly contrasted with the party-line ideal. Punk’s refusal was thus twofold in its temporality. Punks immediately rejected the New Man in the present as well as his future-oriented image as propagated in normative culture. Chapter Two, “Satellit Sascha,” explores the vulnerability of punk’s ruse of apathy through the infamous case of the poet-betrayer Sascha Anderson. One of East Germany’s most prolific poets, Anderson worked as an Inoffizieller Mitarbeiter, a citizen spy, for the Stasi, reporting for more than a decade on the scene he claimed to nurture, even after he had emigrated to West Berlin in the mid-1980s. Howes identifies punk as a fundamental influence on Anderson’s aesthetic in his GDR-era poetry and songwriting, as primarily shown by the author’s refusal to admit, even later on, that his betrayals were indeed disloyal or dishonorable. Here Howes claims more for punk than Anderson has allowed, arguing that though “punk’s power is delimited by Anderson’s lack of ambitions for its use” (p. 92), a transgressive ethos of punk remains nevertheless within the poet’s work. In this case, Howes seems to be himself recombining Sascha Anderson, using this deeply disfavored author’s artistry as a model for something outside of biography, something wild and contradictory, something inherently punk. Howes returns to the punk relationship to the state in Chapter Three, “It’s Punk Time!” describing here punk’s detachment from the East German temporal ideal. In opposition to the New Socialist Man, whose representations were moored to future-oriented visions, the punk maintained a present-oriented attitude that neared nihilism. Howes complicates the familiar “no future” refrain, however, through rich interpretations of songs by a number of East German musicians, using the state-supported band The Puhdys and the polemic rock group The Klaus Renft Combo as important precedents for punk’s ambivalent, often contradictory, relationship to time. Punks acted within their own form of futurity, offering an alternative to the state that was complex and not simply destructive: “a back-to-the-prehistorical idealism which, if utopian, is certainly different from the technological utopianism, and its concomitant temporality, articulated with the goals of the civilizers [i.e., the state]” (p. 146). The case study presented in Punk Avant-Gardes’ final chapter, “DDR von Unten: Punk Space,” theorizes punk as an embodied cultural enactment. This section combines image analysis of state and private photographs with several decades of Stasi reports on the observation and handling of the East German punk movement. Howes describes how punks recoded space both to make room for themselves and as a way to obviously reject the corporeal ideal of the East German citizen. Because punks entered public spaces, their excesses (i.e., piercings, spiked hair) rebuffed not simply state expectations for the individual but also those related to the East German territory writ large. Punk is then, ultimately, about much more than the single act in isolation. It is about the way it might impact and influence culture well beyond itself. Howes concludes with a brief look at East German punk after 1989. Outside of the context against which punk defined itself—namely the East German state and particularly its cultural and security apparatuses—this subculture lost its generating ethos. This is, of course, not to be read as a failure of punk, but it rather illustrates the importance of contextual specificity as creative and meaning-making. Articulating East German punk as a unique case with a global sensibility is this dissertation’s greatest benefit. In the mid-1960s, historians and cultural theorists began to turn their attentions to the idiosyncrasies of normative culture’s factions. Giving credence to lesser studied subjects of history left behind by the grand narratives of the academy, scholars elevated subcultures, from artists to musicians to activists, to the cultural norm. Given that Cultural Studies emerged during the Cold War, those who are invested in the research of subcultures will be interested in finding that iterations in the East Bloc, and particularly in East Germany, of even some of the most infamous subcultures in the West remain largely unexplored. This dissertation on East German punk is one of few studies of its kind, particularly in the English-language literature. If, as Howes claims, “the study of punk [is] a signal culture of the Cold War” (p. 216), then its absence from the already well-canonized discourses of British, West German, and US punk suggests a profound neglect that must be addressed, not simply for the sake of East German (or East Bloc) punk, but also for a richer understanding of punk as a transnational phenomenon. University of Michigan. 2012. 234 pp. Co-Chairs: Julia C. Hell and Johannes von Moltke. 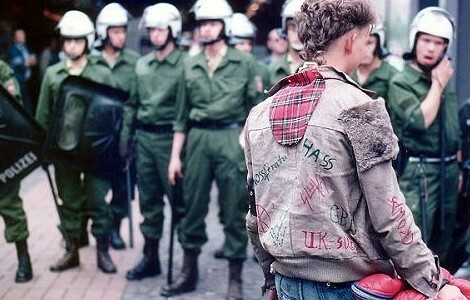 Image: A German punk faces a line of riot police at a 1984 protest. From Wikipedia.